ANSWERS Book Reviews » Blog Archive » "Jerusalem Countdown: A Warning To The World"
"Jerusalem Countdown: A Warning To The World"
This book is essential and just a bit scary. The First section is well worth the price of the book. Pastor Hagee is a friend of former Israeli prime minister Benjamin Netanyahu, and is privy to a lot of Israeli intelligence information. The first section contains info. on the Iranian nuclear threat from Israeli sources and from the press. The volume of material documenting the seriousness of the potential threat for Israel and the USA is quite unsettling. The use of nuclear weapons against Israel and US cities is a stated goal of the Iranian leaders, especially their current president Mahmoud Ahmadinejad. It seems to be just a matter of time before we’ll be facing this threat, and the time seems to be very short indeed. Pastor Hagee ends Section1 with a chapter on “Unveiling Islam”. Here, he talks about the theological and sociological characteristics of Islam that support radical terrorism and lead to the threat that we are facing. Section 2 contains a short history of Jerusalem and the Jewish people. 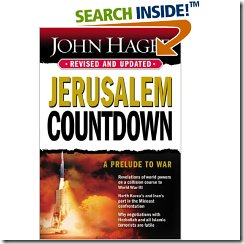 In section 3, John Hagee gives us his perspectives on the place of Israel and possibly the USA in the end-times, an eschatological view from prophetic scriptures yet to be fulfilled. In the final section, Pastor Hagee gives us his interpretation of Romans 9-11, another valuable and interesting teaching. Though some Calvinists might cringe a bit here. Then the book ends with a chapter listing five Biblical reasons why Christians should support Israel and the Jewish people. Here, I generally agree with Pastor Hagee. However, I believe that Christians should also be concerned about Palestinians and Arabs in general. The Gospel must go to every nation, and we really do need to show our love and concern for these folk also, and pray for their salvation, even those who are our enemies.